I just came from keeping service at the Church of God and it was so amazing! We saw how small this earth is compared to the universe out there. Even though this earth is so small, most people live thinking this is it. Everybody is always thinking about the same things; obtain better physical things to have a better life until we die. 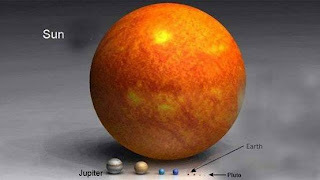 The thing is... no matter what we do, it is so minute because this universe is huge! Even if this earth were to dissapear, it would actually do nothing. Nothing or no one would be missed. 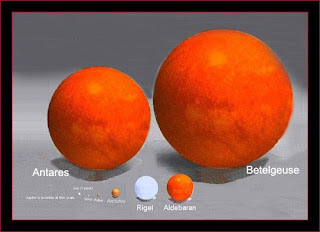 Here we can see how small is the Sun! If we imagine the earth in this picture... it is almost non-existant! Physically, nothing we do makes any difference whatsoever! The beauty about the Word of God through the service was that to this small earth, which God calls "drop in a bucket", God came to bring salvation and eternal life! Christ Ahnsahnghong brought all the hidden teachings that are in the bible when He began His ministry. I truly believe He is God because only He was the One that taught us all about how to inherit Eternal Life to go to the Kingdom of Heaven. If it weren't for Christ AhnSahngHong i too would be having a life that would just end up in death. God AhnSahngHong taught us that through Heavenly Mother and the Passover we are able to enter the spiritual world, which is waiting for us. Thank You so much Christ AhnSahngHong because You have truly given me hope to what I cannnot see but will inherit afterwards. Now I always smile and laugh because I really know that my life on this tiny earth is not in vain! I look forward to the future! Today I studied more about AhnsahngHong in the Bible and a thought came into my head. I was very negative when I first heard about 2nd coming Christ being AhnSahngHong, but luckily, or I should say, thank God, I studied there and figured out for myself if it's true or not. What came to my mind was "why was I personally so doubtful about Christ AhnSahngHong's Teachings". It's interesting that while I was not even attending Church, I didn't doubt anything. Or even when i was attending a Church, I didn't doubt any of those teachings at all. Even there are so many traditions observed nowadays (that don't even know reason for celebrating) that I didn't doubt at all! I also think it's very interesting the fact that I wanted to blame Christ AhnSahngHong for showing the bible, but never blamed the priests from other churches that actually violate the law in so many ways. Many people were just like me, but God Ahnsahnghong took pity on me and held on to me. It was God that gave me the opportunity to stay long enough to understand and distinguish the truth from falsehood. The more i study the bible, the more i see that everything points to Christ Ahnsahnghong. He really is the Christ and Savior the people have been waiting for! Listen! Your watchmen lift up their voices; together they shout for joy. When the LORD returns to Zion, they will see it with their own eyes. This verse is amazing to me because it clearly says that when God returns, He will come to Zion and the people will see it with their own eyes! This is so true! Zion is no other than the Church of God, World Mission Society. The One that the Church is proclaiming as God is Christ Ahnsahnghong. He was the one that established all the teachings of Jesus Christ that were lost through history. It's because of Christ AhnSahngHong that now the people are keeping the Sabbath, the Passover, Pentecost, Tabernacles and the other feast of God that were kept 2,000 by Christ and his disciples. Since Church of God is Zion and the One that has restored everything has been Christ AhnSahngHong, everything makes sense! I can see the Lord's return with my own eyes, just like it's written in the bible! I am more confident today than yesterday that AhnSahnghong is God. There is no other explanation. Everything that I have studied so far in the Bible points to Him as being Second coming Christ. I hope my family and everyone would know and understand these news! When everyone finds out it's going to be huge! Keep your eyes open! Christ Ahnsahnghong is the Christ everyone's waiting for. Whoever sees the The Bible just as a story its wrong, dont waste time. The bible testifies about the Savior who will redeem mankind, and in this last age the Savior is Christ Ahnsahnghong. Unfortunetely not everyone will believe in him as the Bible already prophesied and it is sad because without knowing God we cant go to Heaven. No matter what wether we believe or not everything will be acomplish. Matthew 5:18 I tell you the truth, until heaven and earth disappear, not the smallest letter, not the least stroke of a pen, will by any means disappear from the Law until everything is accomplished. It is only thru the Bible we will be able to find the way of salvation. In this world where so many things are happening we need to assure our salvation from God and not from men. 2 Timothy 3:14 But as for you, continue in what you have learned and have become convinced of, because you know those from whom you learned it, and how from infancy you have known the holy Scriptures, which are able to make you wise for salvation through faith in Christ Jesus. Salvation is Eternal Life, thats the best gift God could ever give us sinners. John 8:51 "I tell you the truth, if anyone keeps my word, he will never see death." Only thru Christ's words we have life. Then what is Christ's words? John 16:12 "I have much more to say to you, more than you can now bear. But when he, the Spirit of truth, comes, he will guide you into all truth. He will not speak on his own; he will speak only what he hears, and he will tell you what is yet to come. Among so many things he spoke 2,000 yrs. ago this is one of them. Only the Spirit of Truth will show us the truth. Then is Sunday, Communion, Idolatry, Christmas the truth? NO, thats all a lie made by men. Sabbath, Passover, all the Feasts of God thats the truth given by God. Spirit of Truth is Christ Ahnsahnghong who brought all of these things which were destroyed by the evil. The reason why we can't believe Christ Ahnsahnghong its because of our physical mind, thru the physical we can't understand the spiritual. 2,ooo years ago they didn't believe in Jesus Christ because of the way he appeared to this earth. Now it is the same, but appereance it's not important. The fact that Christ Ahnsahnghong brought the truth, thats enough for us. 1 Corinthians 4:5 Therefore judge nothing before the appointed time; wait till the Lord comes. He will bring to light what is hidden in darkness and will expose the motives of men's hearts. This is not about first coming Christ, but this is referring to 2nd Coming Christ. Christ Ahnsahnghong and Heavenly Mother is the truth. Christ Ahnsahnghong restored the Passover, this Feast is so important because it is the only way to receive Eternal Life. John 6:53 Jesus said to them, "I tell you the truth, unless you eat the flesh of the Son of Man and drink his blood, you have no life in you. Whoever eats my flesh and drinks my blood has eternal life, and I will raise him up at the last day. Then God said, "Let us make man in our image, in our likeness, and let them rule over the fish of the sea and the birds of the air, over the livestock, over all the earth, and over all the creatures that move along the ground." Everyone knows the story about the creation of the world but nobody paid attention to what God said. The one talking is God! And God spoke in plural, not singular! Then two images of God came out. Male and Female! There are also so many verses explaining about the female. The Spirit and the bride say, "Come!" And let him who hears say, "Come!" Whoever is thirsty, let him come; and whoever wishes, let him take the free gift of the water of life. Here the bride is the wife of God! "...Come, I will show you the bride, the wife of the Lamb... and showed me the Holy City, Jerusalem, coming down out of heaven from God"
The bride is Jerusalem from Heaven; Heavenly Jerusalem. Then another verse explains who exactly is "Heavenly Jersualem"
But the Jerusalem that is above is free, and she is our mother. I find this sooooo amazing! Heavenly Jerusalem is our spiritual Mother! Just as there's God the Father, there is also God the Mother. Study about the female image of God! It's so interesting and makes so much sense. Heavenly Mother Jerusalem will be known by everyone! Isaiah 25:6 On this mountain the LORD Almighty will prepare a feast of rich food for all peoples, a banquet of aged wine— the best of meats and the finest of wines. On this mountain he will destroy the shroud that enfolds all peoples, the sheet that covers all nations; he will swallow up death forever. The Sovereign LORD will wipe away the tears from all faces; he will remove the disgrace of his people from all the earth. The LORD has spoke. In that day they will say, "Surely this is our God; we trusted in him, and he saved us. This is the LORD, we trusted in him; let us rejoice and be glad in his salvation." This says that the Lord Almighty will prepare a feast with wine and will destroy death forever, in other words, give eternal life. There is one feast of God that involves wine and gives eternal life, it's the Passover. So God Almighty Himself will prepare the Passover in the Last days. Many other verses in the bible explain that God will return and bring the Passover to give eternal life. The amazing part is that this is exactly what is happening! The Church of God belives in Christ Ahnsahnghong being God but it's because He was the One that brought the Passover, as the Bible explains. Now I also believe because there is no explanation more clear than this. I am so happy to believe in Christ AhnSahngHong. I have never been happier in my life actually. Even though I attended Church often, I didn't feel happy. On the contrary, i always wanted to leave quickly. Now I am so exited to go study and keep services. Thanks to Christ AhnSahnghong because though He seems like a regular man, His actions actually prove He's Mighty God. I will continue to study the Bible because it's so exiting and interesting!